On 20th June 1837 Queen Victoria acceded to the throne when her uncle, William IV, died aged 71. Victoria had become 18 years old on 24th May 1837 and therefore a period of regency was avoided. Moving on 60 years, Warninglid celebrated the Queen’s Diamond Jubilee with a party held at the Mission Room, Lydhurst. The hall was located just to the west of the original now-demolished Lydhurst mansion, and was accessed either from Warninglid Lane or from an old driveway to Lydhurst at the top of Rifleman Hill. 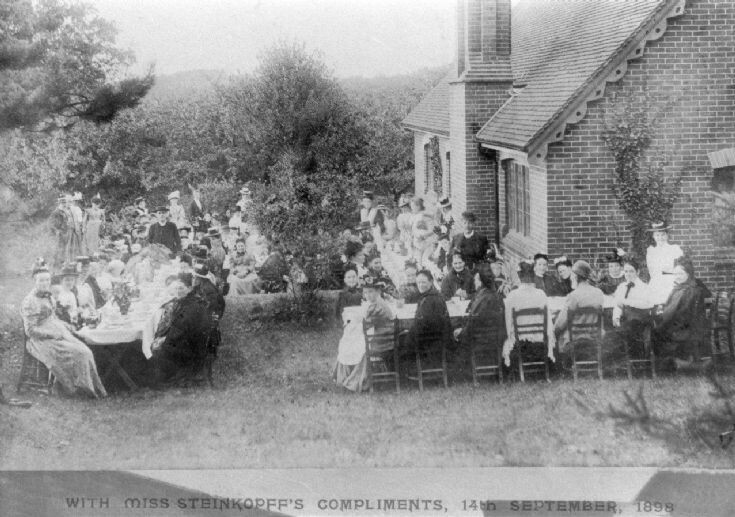 The Mission Room was built in 1887 by Lady Augusta Noel, and her husband, Ernest Noel, conducted services there until the property was sold to Mr Steinkopff. During Mr Steinkopff’s time, permission was granted to the Rector of Slaugham to use the Mission Room as a Mission Church for the people of Warninglid. The utilities and repairs were all provided by the estate. Ernest and Augusta Noel lived at Lydhurst with a full complement of permanent staff comprising a butler, a cook, a lady’s maid, two housemaids, a kitchen maid, and a coachman. Miss Steinkopff, the daughter of Edward Steinkopff, went on to become Lady Seaforth who built the Seaforth Hall in 1925 in memory of her father. There are no clues as to the significance of 14th September 1898, nor the purpose of the photograph’s distribution. The Large version shows a close up of the party in which many of the participants have a close resemblance to their Queen! Click on Open Document to view a representation of 18-year-old Victoria receiving news of her accession from Lord Conynham, on the left, and the Archbishop of Canterbury.